Thousands of protesters have taken part in a Make Poverty History march in Edinburgh, as musicians performed in Live 8 concerts around the globe. Organisers, police and city council officials put the estimate for the number of people involved at approximately 225,000. The marchers heard speeches from political and religious leaders as well as celebrities who back the cause. They called for the G8 leaders meeting at Gleneagles next week to take action. 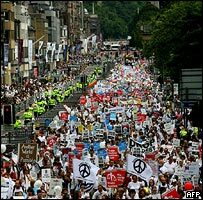 Saturday's march was one of a number of events planned in the run-up to Wednesday's G8 summit and was the largest single protest ever held in Scotland. It coincided with the series of Live 8 concerts in cities around the world, including London. About 200,000 people were in Hyde Park to see performers including U2, Pink Floyd, Madonna, REM and Coldplay. The concerts spanned nearly 24 hours, with the first starting in Tokyo at 0600 BST on Saturday. Organised by Live Aid founder Bob Geldof, they called for more aid for Africa, debt cancellation and fairer trade. Referring to the Edinburgh turnout, a spokesman said: "Make Poverty History are absolutely delighted with this, to see so many people come to show that they really care." Lothian and Borders Police said they arrested just one person at the event in connection with drug-related offences. Assistant Chief Constable Ian Dickinson, who led the policing operation, said: "I want to pay tribute to the crowd of 225,000 who came and cooperated with the police to make this a successful and memorable occasion. "I also want to pay tribute to the organisers of the march who have achieved their objectives through meticulous planning and cooperation." Edinburgh City Council said the success of the march had exceeded their expectations. A spokesman described the crowd as "extremely good-natured". Marchers began leaving a rally in The Meadows at intervals from noon. The head of the procession re-entered The Meadows shortly after 1320 BST. 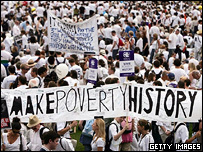 At 1500 BST, marchers - who had been asked to wear white - stopped and held hands in a minute's silence to make a human version of the white band which has been adopted as the Make Poverty History campaign's emblem. A small group of about 50 protesters walked ahead of the main procession, many in business suits and ties, apparently mocking multinational companies. There was applause as they passed a Starbucks and they bowed down towards McDonald's as one of their number chanted: "Two, four, six, eight, we really must accumulate." A strong police presence was in place as the procession turned left off Princes Street and up along Lothian Road towards the city's financial district. Ranks of officers, some on horseback and seven police vans greeted the demonstrators as they were directed away about 100 yards from the Standard Life and Clydesdale Bank headquarters. There were some minor scuffles near The Mound, where the Bank of Scotland has its corporate headquarters. This was spotted from a helicopter and police acted quickly to curb the protesters involved. Earlier, a message from Pope Benedict XVI was read out in which he said people from the world's richest countries should be prepared to accept the burden of debt reduction for poor countries. Chancellor Gordon Brown, speaking at a Christian Aid and Church of Scotland rally following the march, said: "We are today seeing Britain at its best, united as one for a great cause. We have come a long way and have still a long way to go." He met some protesters and assured them that they would not be disappointed by the outcome of the G8 talks. Scotland's First Minister Jack McConnell watched the march as it passed onto Princes Street. He said: "This is fantastic, it is a great carnival atmosphere and it is a message of hope. "We are in a beautiful city with a beautiful message and I hope it is being listened to." Lord of the Rings star Billy Boyd addressed the rally and said: "With so many people here today, the leaders have to do something - thank you for coming." Actor Pete Postlethwaite said: "We have had enough political spin, promises and downright lies." Beryl Chatfield, from Worthing, Sussex, flew from Gatwick to take part and said: "I came to put pressure on the G8 to change things, for fair trade, aid and to drop the debt." Sam Hawkins, 24, from London, said: "I think we're united around a common goal and that is eradicating poverty and working for a fairer world." A number of protesters complained of being photographed by police as they made their way to Scotland. Among them were three coach loads of people from Belfast who said they were held at Stranraer by police, photographed and had their bags searched. Elsewhere, campaigners who took trains from Euston said they were not allowed to make the journey until officers had taken their pictures. A group of about 60 demonstrators, some of them armed with sticks, were closed in following a stand-off with police. Some 200 officers erected barriers and formed lines in an area near Edinburgh University. Half were in full riot gear including helmets and shields. A police spokesperson said some of the black-clad protesters were wearing padded clothing and had been spotted as potential trouble makers. The situation was controlled without any arrests for disorder. 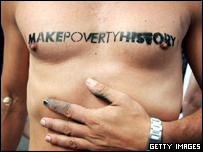 The incident occurred well away from where the Make Poverty History march was taking place. On Sunday, an Anti-War Coalition demonstration will take place in the city, followed by the Carnival for Full Enjoyment on Monday. The latter is giving police concern because of reports that hard-core anarchists will use the event to cause trouble. Assistant Chief Constable Ian Dickinson, of Lothian and Borders Police, said: "We have a long and successful tradition of overseeing marches, demonstrations and other high-profile events in a sensitive manner and enabling protest groups to make their point without having to resort to conflict. "We welcome people who wish to take part but will not tolerate anti-social behaviour or criminal disorder." 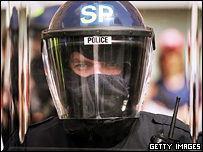 Protest group, G8 Alternatives, is promising peaceful demonstrations. Spokesman Dave Shields said: "When peaceful protesters get together to protest against poverty and war, then things will be extremely peaceful and there is going to be no cause for violence whatsoever."